This division of CSS would be difficult to retro-fit onto an existing site, but if you do it right from the start then it isn’t a problem at all. 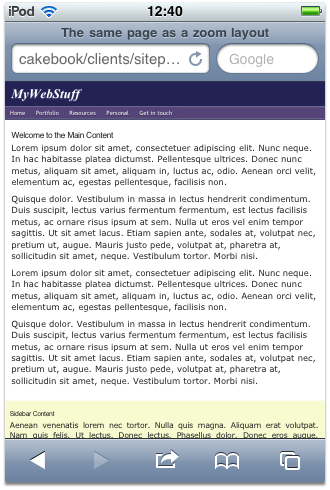 You simply write the structural styles in one stylesheet (floats, fixed widths, things like that), and everything else in the other; test with both enabled, but then switch the structure off from time to time, to make sure the page still works without it. 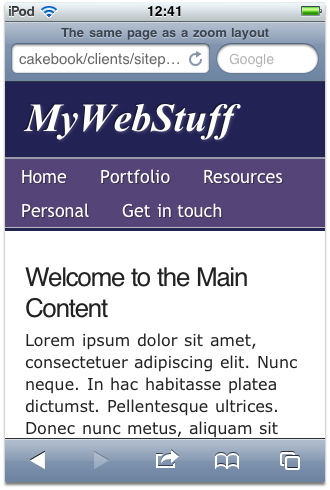 There might be some situations where you need to define special rules in the design stylesheet, which are then overridden in the structural stylesheet. But for the most part it will simply be a case of defining structural rules, that are either enabled, or not. Once we have the stylesheets we can get to the really interesting bit — implementing the switch! The mechanism Joe Clark proposed for implementing the switch between standard and zoom layouts, is to add rev="zoom" to the design stylesheet’s <link> element, to indicate that it only contains the zoom layout rules (and therefore, any include without that rel can be considered a structural stylesheet). Browser-tools, and ultimately browsers themselves, could utilize those semantics to provide a UI switch — Jeremy Keith wrote a bookmarklet for it, and there used to be a Greasemonkey extension. But these never caught-on in a big way, and are possibly part of the reason why the use of zoom layouts is not as prevalent as it should or could be; that, and the fact that they’ve always been painted as a pure-accessibility enhancement, when in fact — as I hope I’ll ultimately demonstrate — they are far, far more useful than that. Even if they offered no accessibility benefit at all, I would still recommend them. Anyway — ordinary users are never going to benefit from something that requires a geek-only Firefox add-on to make the damn thing work! What we need is a way of implementing the switch which hooks into existing browser mechanisms, and even if possible, something which turns itself on when appropriate. And that we can do with CSS media queries. Media queries are a CSS3 mechanism that extends the basic media attribute, so that as well as specifying media types, you can further specify features of the media environment; things like the width of the window, the screen resolution, aspect-ratio, or whether the medium is color or black-and-white. Apple describe this a mechanism for adding iOS-specific style sheets — which isn’t what it is at all! Because it won’t just target iOS devices, it will target any device which matches the media profile. In other words — any screen-media device with a page-width of 480 pixels or less, won’t apply the rules inside that condition. But of course in this case, that’s exactly what we want. Since the latest versions of all the major browsers support media-queries, they’ll all implement this switch, and the end result will be: when you resize the window to 480 or less, the structural styles will disappear and the zoom layout will prevail. So with our styles split into two different stylesheets, we apply them with two different <link> includes. 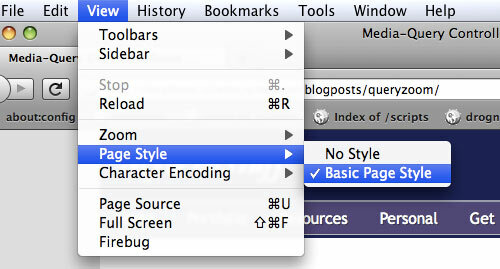 Controlling the structural stylesheet using Firefox’s “Page Style” menu. We could even add a manual stylesheet-switcher into the mix. Page-based switchers can’t really be considered reliable accessibility tools, because you never know whether a site will have one or not. But it doesn’t do any harm to throw one out there as a bonus, and that’s what I’ve done on my site. We’re almost finished, but there’s a couple of device-quirks to consider. The first is the issue of how the iPhone returns its screen size — as its actual screen resolution is far higher than its apparent dimensions. By default, the higher metrics are used to calculate page dimensions, so that Safari is able to render, in tiny detail, complete pages that were designed for desktop devices. The other gotcha is (yeah you guessed it) older versions of Internet Explorer. IE9 supports everything we’ve done just fine, so no worries there, but IE8 and older versions don’t support media queries. Of course older versions of Firefox, Webkit, and very old versions of Opera don’t support them either, but since they do understand the "screen" declaration they’ll still apply the stylesheet. Not so Internet Explorer — IE8 and earlier will baulk over the whole thing, and therefore won’t apply the structural styles at all, if left unchecked. I’ve used internal scripting there, so you can see what’s what, but in practice (and in the final demo) I would use an external script; this code also relies on the fact that the <script> comes directly after the structural stylesheet <link> (because of how it’s referred to in the document.styleSheets collection). If scripting is unavailable it will show the large-screen layout all the time, but that’s undoubtedly preferable to showing the zoom layout all the time. And with that you can tell your clients that you’ve improved, not just the accessibility of their site, but also its appearance in mobile devices, serial devices, print media, older machines and legacy browsers …. and all of it came for free! Hey — nobody ever got fired for doing stuff free!